The development of small tourism businesses has been seen by policy-makers as a valuable means of alleviating poverty in South African townships. This perspective has also been endorsed by several “responsible” tourism businesses and academics. After close investigation of township tourism practices and micro-entrepreneurship in South Africa, Ko Koens and Rhodri Thomas, however, argue that this may not necessarily be the case. In their article “You know that’s a rip-off”: policies and practices surrounding micro-enterprises and poverty alleviation in South African township tourism, they identified several barriers that prevent township residents from successfully developing their businesses and sharing in the material gains available through tourism, even when visitor numbers are significant. These findings suggests a need to critically reconsider current policies in favour of greater regulation and alternative forms of investment as well as a need to reassess the value of advocating responsible tourism to consumers who are often unable to gain full understanding of the context they visit or the implications of their choices. For a short time you can download the article on the website of the Journal of Sustainable Tourism for free. Koens, K. & Thomas, R. (2016) ‘You know that’s a rip-off’: policies and practices surrounding micro-enterprises and poverty alleviation in South African township tourism. Journal of Sustainable Tourism. Last week a new book on slum tourism was published by Routledge Publications. Edited by Fabian Frenzel, Ko Koens and Malte Steinbrink, it contains both theoretically oriented papers papers as well as more practical case study examples of slum tourism of seven different countries on four continent. 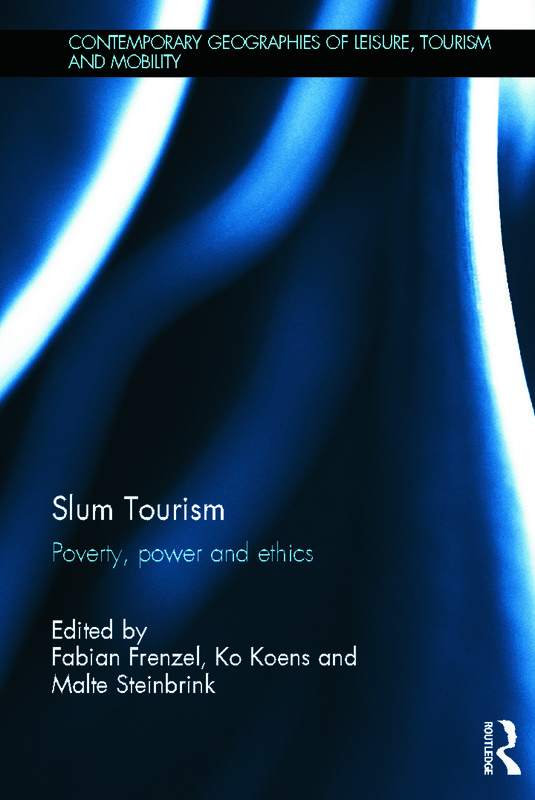 In combination with the special issue of Tourism Geographies on slum tourism that was discussed earlier on slumtourism.net , the book provides a comprehensive overview of the current empirical, practical and theoretical knowledge on the subject. Within the book a critical review of issues associated with slum tourism is provided, asking why slums are visited, whether they should be visited, how they are represented, who benefits and in what way? As such the work promises to offers new insights to tourism’s role in poverty alleviation and urban regeneration, power relations in contact zones and tourism’s cultural and political implications. 1. Slum Tourism – A New Trend in Tourism? In an earlier post I discussed a paper written by Evan Selinger, Kevin Outterson and Kyle Powys Whyte that was published by the Boston University of Law. The authors have published another paper on pvoerty tourism, this time focusing on the ethical question of poverty tourism and the difficulties surrounding consent. They discuss whether it is morally permissible for financially privileged tourists to visit places for the purpose of experiencing where poor people live, work, and play? They discuss some of the pros and cons of poverty and slum tourism and conclude that tourists should only participate in poverty tours if there is a well-established collaborative and consensual process in place, akin to a “fair trade” process. The findings are commendable and provide an opportunity for discussing how to establish what is fair and how often divided communities can benefit. Unfortunately they do not enter this discussion nor how tourists should be able to identify such fair trade processes beyond the establishment of fair-trade poverty tours. Selinger, E., Outterson, K. & Powys Whyte, K. (2011) Poverty Tourism and the Problem of Consent. Boston, Boston University School of Law. Evan Selinger, Kevin Outterson and Kyle Powys Whyte published a paper last month titled “poverty tourism, justice and policy” in which they discuss whether poverty tourism should be subject to specific policy constraints based on moral grounds. They look at this matter through favela tours in Rocinha, Brazil and garbage dump tours in Mazatlan, Mexico. In their conclusion they argue that slum or poverty tours are a result of complex social relationships that require individual attention and policy research. Selinger, E., Outterson, K. & Powys Whyte, K. (2011) Poverty Tourism, Justice and Policy. Boston, Boston University School of Law. Janet Thorne recently wrote a professional report on her experiences of cultural tourism in the Gambia. Her findings suggest that these tours bear similarities to slum tours and, similarly to slum tours are promoted with the promise of an insight into “the real Gambia” by certain tour operators and informal tour guides. Thorne further shows how tourists on package holidays in this mass tourism destination certainly have an interest in such tours. What particularly surprised her on this matter was how similar the interests expressed by tourists in The Gambia were to those in the slum/poverty tourism literature. Among other things, tourists are hoping and expecting to see “everyday life” and have a more “authentic” tourist experience than is offered in general. Tourists are both intrigued as well as shocked by the poverty they see thus partially fulfilling this desire for authenticity. While written as a more practical report rather than a purely academic work of tourism, the report contains much useful information on these cultural tours. The finding that there is demand from for these kinds of tours among package tourists in the Gambia alone is interesting. The destination is mainly known for its Sun, Sea and Sand package tours where tourists come specifically to relax. Thorne goes further however and also discusses different forms of interaction between locals and tourists as well as difficulties of market access and local participation. All in all this professional report brings up the important question of when cultural tourist activites can be categorised as poverty or slum tourism? This may be easy in the case of favela or township tourism as the practices are limited to certain geographical areas. However as Thorne shows, similar practices take place elsewhere as well under a label of cultural tourism. The report can be downloaded here and those wishing to contact Janet can do so at janet_thorne@hotmail.com. http://www.montrealcampus.ca/la-misere-des-riches: Recently an article on Slum tourism appeared in French on the website of Montrealcampus, mainly regarding the ethical aspects of the subject. Left at the Crossroads: Ogling the poor: Slum tourism was also the subject of a column by Marc Saint-Upéry, discussing the ethics of slum tourism and linking favela tourism to tourism in Victorian times. Towship tourism: A mixed blessing: Not so much an article on township tourism, but a photographical slideshow that depicts the concept of township toursin South Africa fairly well.